However, as I've been playing my inquisitor lately, something started to nag at me. I've been spending an unusually high amount of time questing at max level with her, which means that I got to see a lot of my companions. Specifically, the ones that I used the most were Ashara, who is a (fallen) Jedi, and Andronikos, a pirate. All the gear that I put on the former made her look like a Sith, and all the gear that I put on the latter made him look like an Imperial agent. Basically, they both looked like exactly the opposite of what they actually are. So wrong! Unfortunately my options seemed pretty limited at first. All regular and custom gear looks appropriate for your faction's classes, never the opposite faction. The exact same nice Jedi robe will turn into a Sith outfit if you send it over to an Imperial alt. The only items exempt from this are certain social items and gear from the Cartel market. I sure as hell wasn't going to spend real money just on dressing my companions! Fortunately a brief look on the GTN soon revealed that things weren't nearly as dire as they appeared. Thanks to the Cartel packs, people end up with all kinds of undesirable adaptive gear that they then try to sell on the GTN for cheap. And even if it's not an outfit that you would choose for your own character, I found that a lot of it can make for a pretty decent companion look, especially with the addition of some dye. You don't need to gear them too thoroughly either, just a couple of pieces in key slots can do wonders. The coat is really a bit frilly for a pirate to be honest, but at least he doesn't look like he just deserted from the Imperial army anymore. It's a fairly neutral look. For Ashara I ended up buying a couple of pieces that all come in terribly garish and mismatched colours, but one dye module application and colour match later, it all suddenly works and she actually looks vaguely Jedi-like again. Success! And the best thing? All of these items cost me less than 10k credits each (on my server anyway, your own might have different cheap options), most of them even less than 5k, with the exception of the dye kits, on which I "splurged" about 20k a pop. Maybe dressing up your companions to make them look vaguely presentable doesn't have to be an entirely terrible idea after all. Maybe it's just me, but I've a feeling that there's another reason why some people like dressing up their female companions in slave girl and bikini outfits. At least you didn't go that route with Andronikos. I'm not quite sure I'm ready to see him dressed up in, say, a banana hammock. 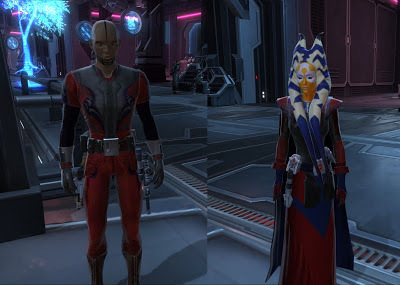 I like dressing up my companions, but it can get high-maintenance if you do it for too many companions or too many toons. A while ago, I dressed my main's companions in social gear just because I COULD. Other than mod stripping, it was cheap, and I like showing off that stuff without wearing it. It always bothered me that you get Scourge, dark sithie, evil as they come, and he gets bright shiny jedi knight gear? Yech. That is so wrong. I'm not thrilled with Mako or Vette wearing imperial agent gear since they seem more "independent" than that. For Quinn, the agent gear works, but I want to punish him by making him wear something ridiculous, TBD.